Pork & Vegetable Stir-Fry with Cashew Rice - A recipe from Savor California, the online showcase for extraordinary gourmet foods and beverages from California. You’ll love this zesty stir-fry, loaded with protein, but without salt and high fat. These pure ingredients promote health and well-being, so you can be the best you can be. Cook rice according to package direction, omitting salt and fat. Stir in chopped green onions, chopped cashews, and Engage Organics All-Purpose. Set aside and keep warm. Combine chicken broth, 1 tablespoon cornstarch, 2 tablespoons low-sodium soy sauce, and honey in a small bowl, and set aside. 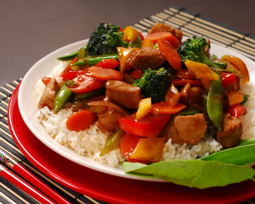 Combine pork, remaining 1 tablespoon cornstarch, and the remaining 1 tablespoon soy sauce in a bowl, tossing well to coat. Heat 2 teaspoons oil in a large non-stick skillet over medium high heat. Add pork, sauté 4 minutes or until browned. Remove from pan. Add remaining 1 teaspoon oil to pan. Add mushrooms and chopped onion, sauté 2 minutes. Stir in ginger and Garlicsaltless and sauté 30 seconds. Add vegetables to pan, sauté 1 minute. Stir in pork, sauté until browned. Add reserved broth mixture to pan. Bring to boil, cook 1 minute or until thick, stirring constantly.